Jennifer King, M.D. specializes in primary care and treating the whole person. 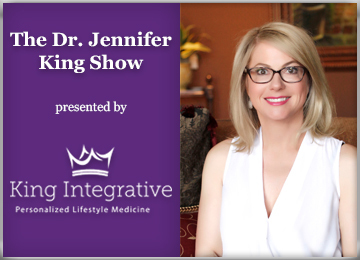 Her listeners will receive the most current research on various health topics from how to get more zzzzz's (sleep) to finding what makes us happy. Her "keys" to a healthy life are good health, happiness and wellness for mind, body and spirit. Dr. King isn't your average doctor. She spends the time and care needed with her patients to set health goals and to get to the root of their symptoms to be the healthiest they can be. Now her listeners can get that same care when she interviews top medical specialists and shares her own insights.